When people want to get rid of a vehicle they do not want, they seem to think the only option they have is trying to sell their vehicle to a buyer. This does not work out as much or as often as one would hope. Trying to sell to a buyer involves a lot of hassle and time. 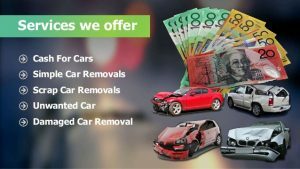 A better and easier alternative to consider is car removal companies like Prestige Car Removal Brisbane that offer cash for cars, no matter what the condition of your vehicle. Companies like these offer you instant cash, which is a great bonus point if you are looking to sell off your car quickly and are in need of money. These companies even take cars that do not have a resale value in the market. Sound too good to be true? Read on to find how these companies work. The initial step is contacting the company in Brisbane for a free, no-obligation quote. You provide them with information about the make and model, as well as the condition of your car. The company will then make you a cash offer. If you like the offer, the company will send a free car towing service your way. This means that you do not have to go through any hassle. The Towing company will arrive at the time that you yourself will schedule. And then they tow your car away while paying you in cash. It is indeed this simple. All you need on hand are relevant documentation about your vehicle, and that is all. The company has been known for different names for their services as Cash for Car, Unwanted Car Removal, Simple Car Removal, Same day Car Removal and Scrap Car Removal. Once your car has been Towed away by the Company in Brisbane, it will be taken to a wrecking yard. Here, the vehicle is pulled apart. Parts that can be reused are separated from parts that cannot be. Metal is sold further to scrap metal companies. Things that cannot be used further, like fluids and fuel, are recycled in a proper manner so as to not harm the environment. Prestige Car Removal Brisbane offers a good price for your unwanted vehicle. We ensure the eco-friendly dismantling of your vehicle. You can save your car from ending up at the landfill and having a negative impact on the environment. We buy all kinds of vehicles, so do not hesitate to contact us at 0423 017 490 or contact us on our website for a free quote.